Are you planning to leave on vacation, attending a business meeting or maybe a special event? You’ll surely make a good impression if you choose our car rental services and rent a Ford Focus, for only 22 euro/ day. 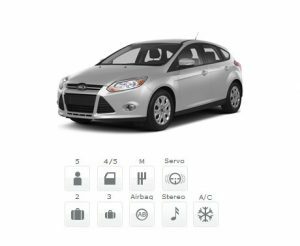 Ford Focus is the perfect choice for any type of occasions, providing you with extra comfort, space, and complete safety. This model of Ford Focus is the most refined up to this moment, being a spacious car with high agility, due to its lively and economical engine. Ford Focus has an optimal fuel consumption, being the ideal solution for those who appeal car rental services and seek extra comfort and impeccable road performances. Among the features of Ford Focus, available through our car rental services in Bucharest and Otopeni, we mention: steering wheel controls, autopilot, electric windows and mirrors, climatronic, ABS+ESP, board computer, Bluetooth parrot, central locking, rain and light sensors, speed limiter, MP3 CD player, 6 airbags, fog lights, auxiliary port (AUX). Throughout our car rental services, we guarantee a fast and completely free car delivery, anywhere in Bucharest. We offer reliable cars to all our customers, while also making a complete technical inspection after each client returns the car. Choosing FocusRent, you will be rewarded with more benefits than any other car rental company could offer: full CASCO and RCA insurance included, fast replacement of the car in case of damage (in only 5 hours), a 24/7 customer service call center, full gas tank and no kilometers limit. And this is not all! If you are a loyal customer of your car rental services, we offer you a 10% discount based on your membership card.